At the beginning of the month, I've blogged about one stock (Lippo Malls Indonesia Trust) and one movie that I've determined to get/watched in the month of September amidst my busy work schedule. I am an happy man now as I've achieved both of them (click here for my subsequent post of Lippo Malls). 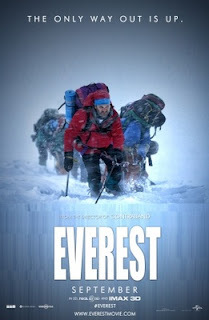 Everest (movie review) - Been waiting for this movie and it doesn't disappoint! With such sterling casts, I guess it is hard to fail. Even though the panoramic killer view of Everest and the nail biting thrill are what I am looking for initially but I was ended up thrilled by the emotional rides that the characters are going through. There is a fair share of thrillers happening on the mountain but they didn't over do it and put the focus rightly on the heart and soul of the characters. There are lots of informative and factual stuff about scaling the "beast", a movie that the audience can learn something about.